How you store your pens and/or how to you carry them with you? Thread: How you store your pens and/or how to you carry them with you? Re: How you store your pens and/or how to you carry them with you? That pen wrap is beautiful! Where did you get it? I carry them in two Nock cases (a three pen case and a Sinclair case). The others are stored here and there in repurposed jewelry boxes and Nock Brasstown cases. I do also have a 6 pen case from Franklin Christoph that sits on my desk (current users) and a pen roll from Liz Newton (also current users) and a zip around 16 pen case (also current users). What can I say? I ink a lot of pens! I carry in groups of three. Today I had these in my briefcase so I could write a few cards for National Handwriting Day (thank you, Jon!). I don't keep a lot of pens. I buy and sell and rotate through, so my "collection" is small enough to fit in a simple 12 pen display box. When I'm taking pens to work it's usually in a Nock Co. Sinclair three pen case. Right now I'm only carrying one pen, so it's in a green leather single pen zip case that Sammyo sent from Japan. I keep a small footprint 16 pen box on my desk and I carry in either a two or three pen case. Plus there is always a pocket pen in my pocket. For storage of more I use drawers in an old tool chest. I have several desks in various rooms and it is easy to pick up the box with pens at ready and go to one of my other writing areas. Depends...I used to carry my pens in a leather case for years. Nowadays I simply keep my nicer pens at home and carry my workhorse pens (like the custom 823 and Lamy 2000) in my pockets. At one point, I was carrying several thousands of euros in pens to work every day in leather cases and figured this is getting absurd. Not for fear of them getting stolen, I know nothing would get stolen at my workplace, but just due to the sheer impracticality of it all. When I leave the house, it's usually in this Pelikan 3 pen case. 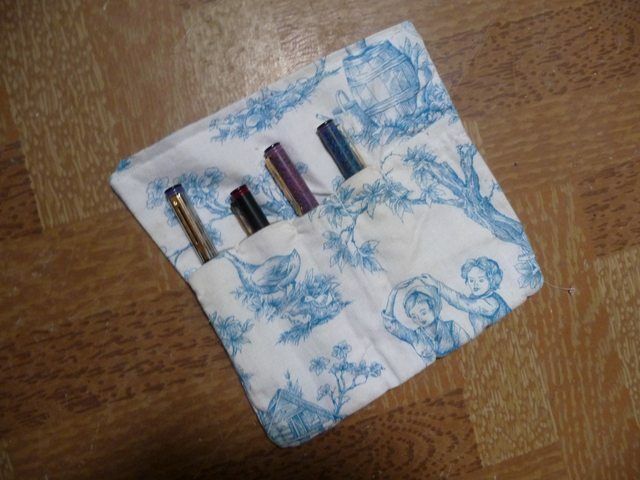 Many years ago my partner bought me a 40-pen case for Christmas. Then I bought a 12-pen display stand off a "well known auction site". Very smart, but it only takes slim pens. Then came a 40-pen leather case. Note those ominous empty loops! I don't have a large collection of pens, but I do use what I have regularly. A fellow pen enthusiast I came across converts old silverware boxes into pen storage cases. 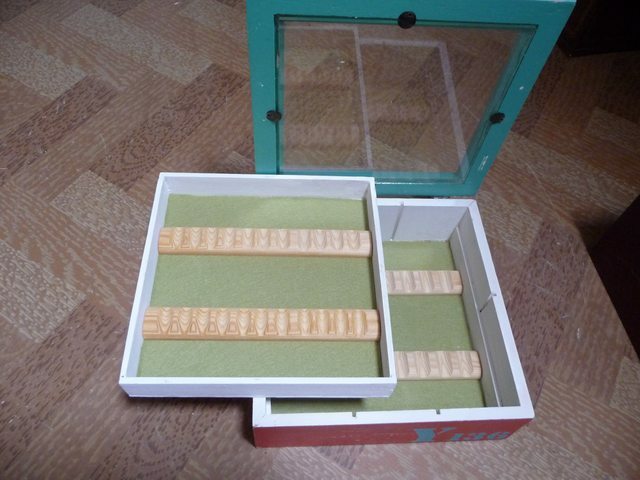 He removes the silverware storage set up and puts in slotted felt trays suited for pens. He also refinishes the wood exterior of these boxes. The materials and construction of these old cases are generally quite nice. Most are made of mahogany with dovetailed joints. Used cases can be found for very reasonable prices and repurposed for pens. I asked him to make a pen drawer to attach to my desk. He used an old silverware box top flipped upside down. It became a shallow drawer with pen storage channels that was refinished to match my desk . I attached drawer slides and installed it under my desk top. For me, it works nicely, as my pens and pencils are stored out of the way but readily accessible. Last edited by gordonf; February 5th, 2019 at 02:58 PM. That's a really neat idea. I wish I had a pen tray at the top of my little set of filing drawers. That's an IKEA hack waiting to be made! Carry: I got this leather case from a fellow on Etsy. I just picked up materials to attempt a pen wrap. If I don't flub it too badly I will post a pic. 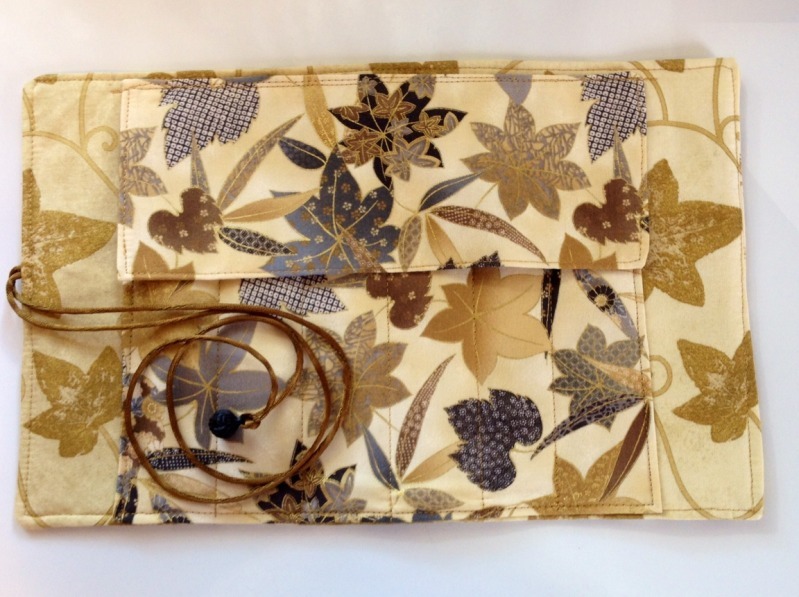 Storage: I just got a cheap 48-pen case for storage and taking to pen posse meetings. And I have 3d printed pen rests for my inked pens. Last edited by azkid; February 9th, 2019 at 03:13 PM. Here is my just-completed pen wrap prototype. I am already planning a few design improvements for the next one. Also, don't look too closely at the stitching.